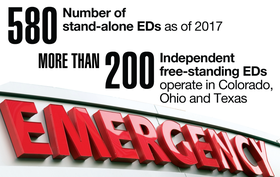 The past decade has seen a proliferation in the number of stand-alone emergency departments. In Texas, where growth has been unprecedented, there weren't any stand-alone EDs before 2010. After the state starting issuing licenses, the number shot to 191 by 2016. But in some markets, the saturation is too much to handle. Neighbors Health System recently closed a free-standing facility in El Paso. And Complete Emergency Care is curtailing plans to expand services in a crowded El Paso market. Download the PDF.